One of the most critical hours of the Army of the Potomac begins with an army on the move in the face of the enemy. General Wood receives his infamous order to move his division north, creating a gap in the Union line. Assured by Twentieth Corps commander Alexander McCook that nearby units will fill the gap, Wood begins moving his division. Laiboldt’s brigade of Sheridan’s division begins moving north to support the division of Jefferson C. Davis. The fighting at Kelly Field continues. Two brigades of Breckinridge’s Division appear at the north edge of the field. More units are rushing to the scene. The Confederate Reserve Corps begins to arrive in the area, and Van Derveer’s brigade arrives to reinforce the Union position. 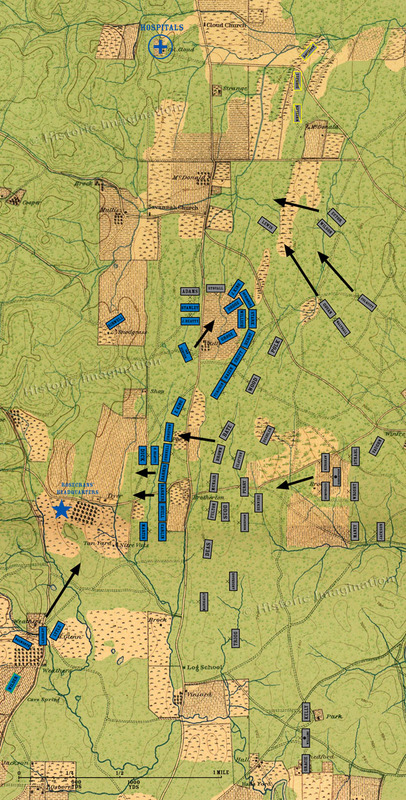 Angry at the disruption of the en echelon attack, General Bragg sends bypasses the chain of command and sends orders directly to all remaining division commanders to attack at once. General Alexander Stewart receives his and begins his advance. Brigadier General Joseph Kershaw moves his division forward to support Hood’s Division.